As I may have mentioned before, I have been spending an occasional hour or so doing the auto loop at the Edwin B. Forsythe National Wildlife Refuge, better known as Brigantine. One of the amazing aspects of Brigantine in late spring is the sheer volume of turtles one can encounter. On a single trip I have seen four species of turtle, which must be my all time high in one day. 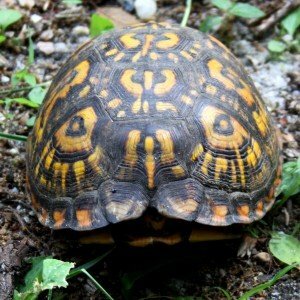 As someone who does not know turtles very well I have treated my turtle encounters as learning experiences, taking watching them, taking pictures, and identifying the ones I am not entirely sure of when I get back to my computer and an internet hookup. 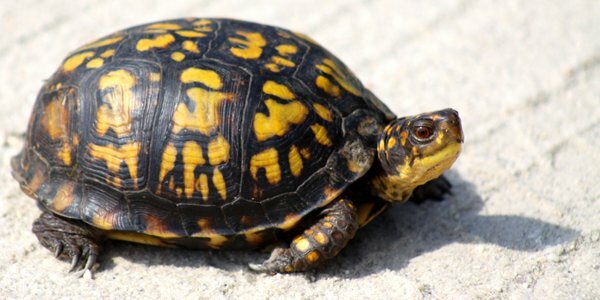 According to the Field Guide to Reptiles and Amphibians of New Jersey (link is a PDF) there are thirteen species of turtle that can be found in the state, so I have already spotted just under a third of the turtle species that there are to see in the Garden State. 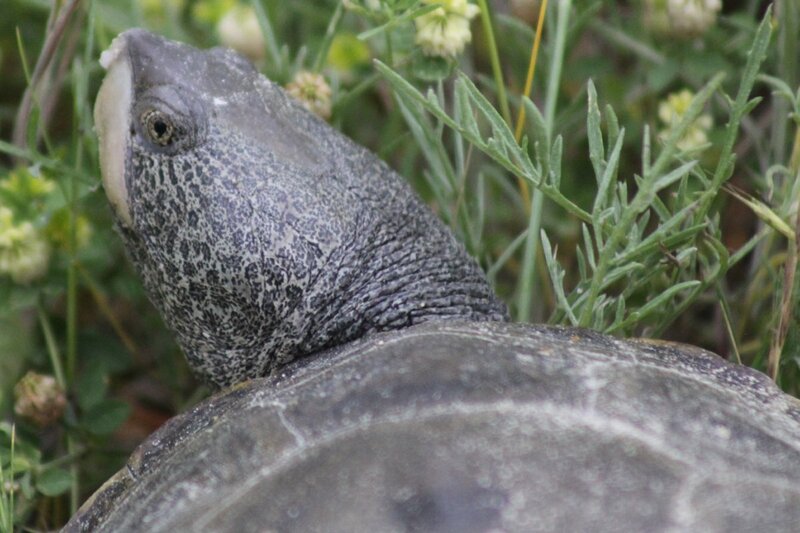 Unfortunately, I have not managed a decent photograph of a Snapping Turtle in New Jersey yet, so you will have to be happy with shots of only three of the species I have spotted. Happy turtling! First up is the familiar turtle of the eastern woodlands, the Eastern Box Turtle Terrapene carolina carolina. I saw a couple of them on my visits and never fail to be amazed by their ability to use their hinged shell to close up tight. 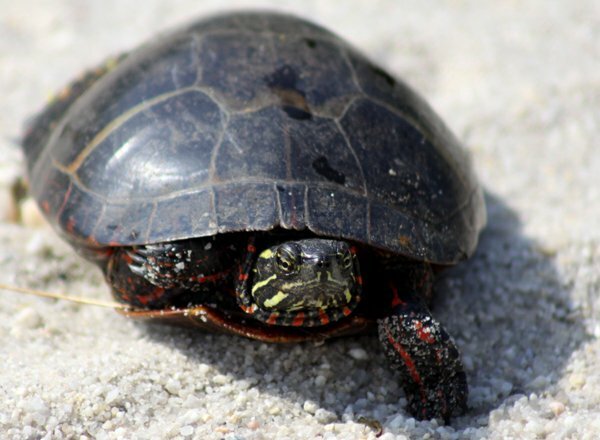 The second turtle, about which I don’t have much to say other than it is a pretty darn common species of turtle, at least in the northeastern United States, is the Eastern Painted Turtle Chrysemys picta picta. Finally, the turtle species that I saw more than any other, the one that is in the “Turtle Crossing” picture above, the Northern Diamondback Terrapin Malaclemys terrapin terrapin. They are known for living in saltmarshes and other brackish habitat and are highly variable in appearance, in addition to being dimorphic. They are also easily my favorite species of turtle. How could anyone not like these things? I hope you liked this brief post on the turtles of Brigantine and that you are inspired to get out and get looking for turtles yourself. Just remember to leave them undisturbed and to never take a turtle out of the wild to keep as a pet. 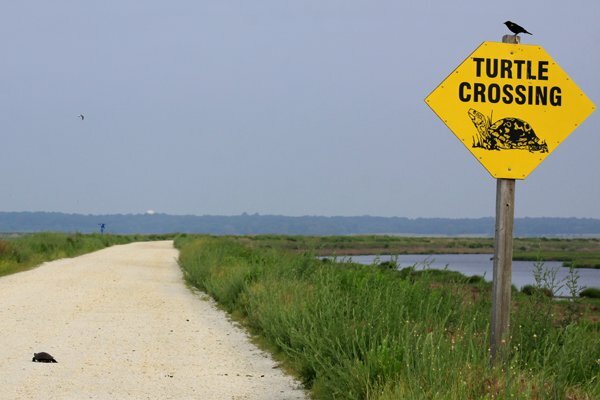 It is bad for the turtle and could be bad for you! When I lived in South Carolina 2002-03 (pre-birder, darn it!) I remember all kinds of turtles there too. 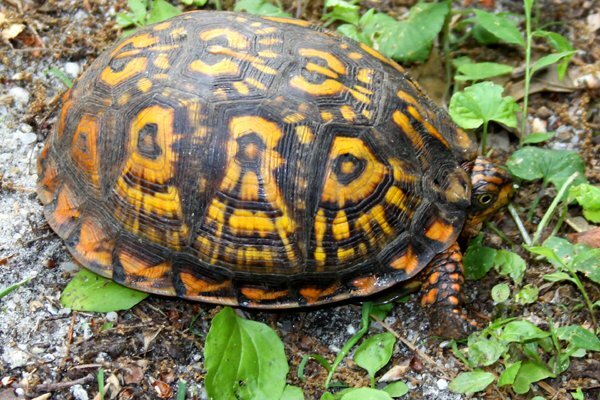 In May, the box turtles were all over the highways and regularly became roadkill. I often stopped and assisted them in safely crossing the roads. They are just too cool to let get run over. Had a Map Turtle in a NJ park on the Delaware River last May. That’s a big turtle! He was walking around the park entrance, but as usual no one saw him, so I had to drag every kid (and parent) I saw over to enjoy him. Thanks for the turtle photos and info. San Francisco – short of time and money.